I love Roses… pink, coral, yellow, and white are my favourite. Which is why Rosette cookies and cupcakes are one of my favourite things to make for my family and for gift giving. Who doesn’t like to receive a bouquet of roses. 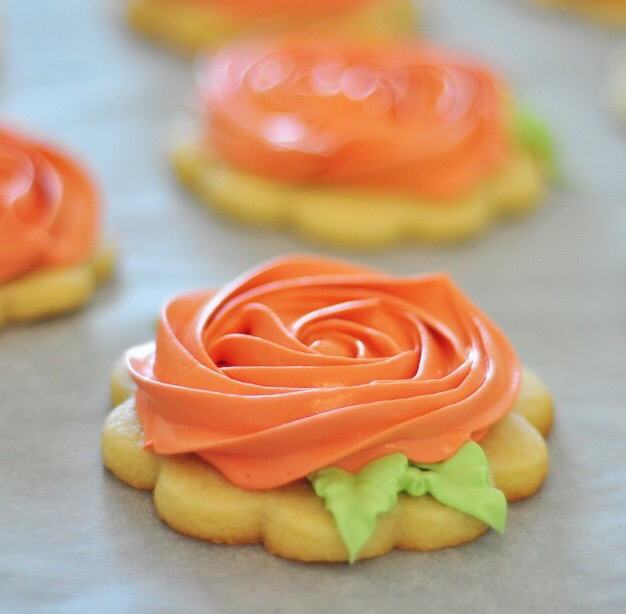 Wait until you show up with dozen Rosette cookies. These cookies look beautiful but their taste is what is important! I have made these cookies with every buttercream out there. Super delicious. But stackable or easy for packaging they are not. Which is why these Rosette cookies with Royal icing are my new favourite. Once hardened the icing can be gently stacked for placement in a cellophane bag. They really are quite stunning to look at as well. Place them in a glass jar on your counter and you have fresh edible flowers. Sadly they don’t last as long as real flowers 😉 they are consumed too quickly! These make the perfect gift for Mother’s Day. Give her a dozen cookies along with a gift card or real roses and you will have your momma smiling from ear to ear.. Hint hint..
Of course not just for Mother’s Day but wonderful for teacher & hostess gifts, wedding favours, and themed parties. They really are easier to make than they look. Give them a shot.. Come on make them for yourself, you deserve it. Seriously delicious! Excuse while I go take a bite! In the video below I show how you can make a leaf without a leaf tip. Of course if you have a leaf tip use that. It works in the exact way the disposable icing bag works. I thought a video would show a little easier than step by step pictures in this post. Look too pretty to eat! Enjoyed the video , its always a extra bonus to your blog posts. How far I’m advance can you make these to where they still are good if put in a container or baggy? These can be made 4-5 days in advance to remain fresh for an event. (I usually let the icing dry for a day and then bag the cookies or place in the refrigerator in a container to aid in keeping the cookies their freshest. You can freeze these and defrost out of the container however, you may have one or two cookies that have small dots of color variation (moisture spots) barely noticeably and they don’t affect taste. Hope this helps. I would like to know what color(s) you used to get that gorgeous coral. I used approxitmate ratio of 3:1 orange to pink. I always add a food coloring a dot at a time. You can always add more icing though if you add too much. I like to keep a cup extra on hand incase this happens. It also depends on your icing recipe, whether your icing is more white or more ivory ie: buttercream. Icing alway dries a darker color. I alway pretest colors especially if making for an event. Nothing worse than finding the perfect color while the icing is wet, then once the icing is dry not the color you were hoping. Start out with a shade or two lighter than what you want the dried icing to look like. Hope this help.